By James B. Nelson on Wednesday, February 3rd, 2016 at 8:49 a.m. Items old and new attracted the attention of PolitiFact Wisconsin reader in January. And even though Wisconsin doesn’t hold its presidential primary until April 5, our monthly list of most-clicked items showed readers were doing a little research into national candidates and issues. Here’s our High Five list of most-clicked items for January 2016. 1. The Democratic Party of Wisconsin issued a news release Jan. 14, 2016 blaming Gov. Scott Walker for a steep decline in performance on the ACT college prep exam. The Democrats said Wisconsin fell from "second in the country to 41st." There was one problem with this statement: the math. The party erred by comparing scores of two different groups of students -- a large group of 64,000 juniors who took the test under a new program that gave them the opportunity to take the test with fees paid by the state, and 46,000 seniors who took the the test. The state’s composite score for the juniors was 20; while the score for seniors was 22.2. The state Department of Public Instruction warned against comparing the two groups of scores, but that’s exactly what the Democrats did. 2. 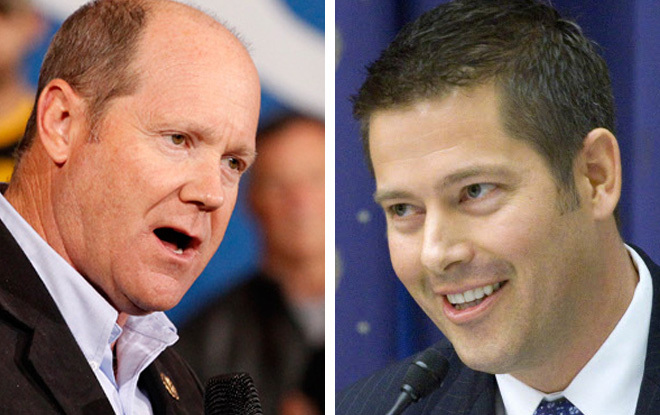 U.S. Rep. Sean Duffy (R-Wausau) took heat for statements he made on the House floor Jan. 7, 2016 regarding the high rate of abortion among African-Americans. The Congressional Black Caucus and U.S. Rep. Gwen Moore (D-Milwaukee) condemned Duffy’s comments. Our In Context article shed light on his statements, including statistics he cited regarding abortion. "The African-American community is 15 percent of the country as a whole, but account for 40 percent of the abortions -- 15 percent of Americans, 40 percent of the abortions." 3. State Rep. Dale Kooyenga (R-Brookfield) made an eyebrow-raising claim about student loan debt. Some Democrats are pushing bills that would allow refinancing at the state level. Kooyenga told a state-wide radio audience: "A lot of student loans are already refinanced by the federal government." But the federal government does not do student loan refinancing. 4. There was also this blast from the past -- or at least last fall, when presidential candidate Donald Trump began surging in Republican polls. U.S. Rep. Reid Ribble (R-Sherwood) criticized Trump on Sept. 8, 2015 as being not a true conservative and said Trump "wants to replace" Obamacare "with a single-payer system." Trump continues to praise single payer -- a health care system in which the government pays for care for all citizens -- at least as it used in other countries. But he has spoken a number of times, if vaguely, about a private system and at one point said he does not support single payer in the United States. 5. We need to go back even farther for our final item, to an appearance by Republican Party Chairman Reince Priebus on CBS’s "Face the Nation" in April 12, 2015. Priebus said Democratic presidential candidate Hillary Clinton received campaign contributions from the kings of Saudi Arabia and Morocco and Oman and Yemen. The monarchies of Saudi Arabia, Morocco and Oman have contributed to the Clinton Foundation, but Yemen, which does not have a king, has not. And contributions to the foundation are not the same as contributions to a candidate.